We offer qualitative range of Imported XINYA Terminal Block. 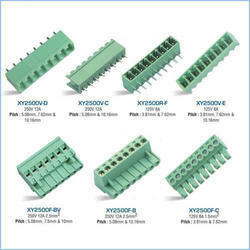 our terminal block also equivalent of phonix connectors & also called green connector.These are imported from well renowned manufacturers and comply with the international standards of the trade. To ensure quality, we also conduct various quality checks even at our own premises. Our range of Terminal Block are used in different types of electronic devices and is available in various sizes to choose from as per requirement. Decorative Tube Fixtures, CFL Adapter & Halogen Transformers, Street Light Controller, Refrigerators, Bank Alarm Systems, Air Conditioner, Water Filters, Fire Fighting Equipments & Systems, Life Controller, Display Boards, Access Control Systems, Industrial Controls & Audio Systems. We offer qualitative range of Imported XINYA Terminal BlockS. 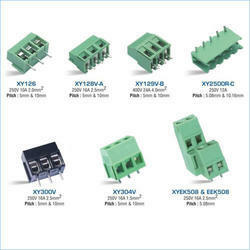 terminal block are equivalent of PHONIX TERMINAL Blocks this connetors are also called Green Connectors.These are imported from well renowned manufacturers and comply with the international standards of the trade. To ensure quality, we also conduct various quality checks even at our own premises. Our range of XINYATerminal BlockS are used in different types of electronic devices and is available in various sizes to choose from as per requirement. Control Panels, Power Controls, Instrumentation ,Security Systems, Relay Modules, Automation Systems, Electronic & Magnetic Chokes, Energy Meters, Weighing Instruments, UPS, Inverters, Stabilizers, Alarm Systems, Temperature Controllers, Elevators, SMPS, Electronic Ballast for Industrial & Domestic Use, Decorative Tube Fixtures, CFL Adapter & Halogen Transformers, Street Light Controller, Refrigerators, Bank Alarm Systems, Air Conditioner, Water Filters, Fire Fighting Equipments & Systems, Life Controller, Display Boards, Access Control Systems, Industrial Controls & Audio Systems. Looking for XINYA Terminal Blocks ?